Iodine Global Network (IGN) - 4. Where do we get iodine from? Iodine (as iodide) is widely but unevenly distributed in the earth’s environment. In many regions, leaching from glaciations, flooding, and erosion have depleted surface soils of iodide, and most iodide is found in the oceans. The concentration of iodide in sea water is approximately 50 µg per liter. 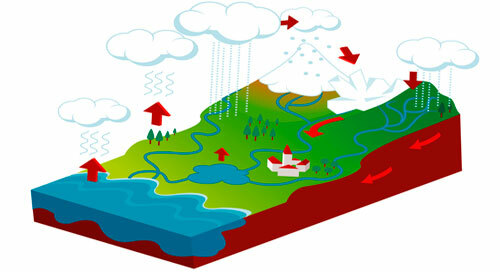 Iodide ions in seawater are oxidized to elemental iodine, which volatilizes into the atmosphere and is returned to the soil by rain, completing the cycle. However, iodine cycling in many regions is slow and incomplete, leaving soils and drinking water iodine depleted. Crops grown in these soils will be low in iodine, and humans and animals consuming food grown in these soils become iodine deficient. In plant foods grown in deficient soils, iodine concentration may be as low as 10 ppb dry weight, compared to 1 ppm in plants from iodine-sufficient soils. Iodine deficiency in populations residing in low-iodine areas will persist until iodine enters the food chain through addition of iodine to foods (e.g. 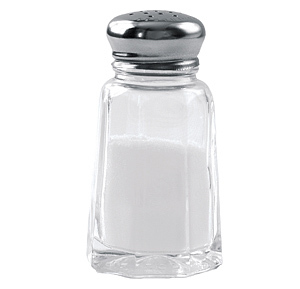 iodization of salt) or dietary diversification introduces foods produced outside the iodine-deficient area. Most of the iodine we consume comes from what we eat and drink. The native iodine content of most foods and beverages is low. In general, commonly consumed foods provide 3 to 80 µg per serving. 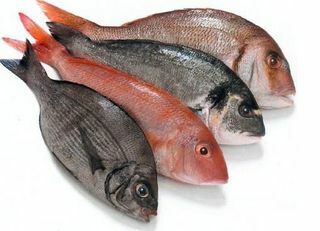 Foods of marine origin have higher iodine content because marine plants and animals concentrate iodine from seawater. Iodine in organic form occurs in high amounts in certain seaweeds. Inhabitants of the coastal regions of Japan, whose diets contain large amounts of seaweed, have remarkably high iodine intakes amounting to 50 to 80 mg/day. Salt water fish and seafood have high natural iodine content, but their contribution to the overall dietary iodine intake is modest unless consumed every day. Freshwater fish reflect the iodine content of the water where they swim, which may be deficient. Other foods vary tremendously in iodine content, depending on their source and what may have been added. Plants grown in iodine-deficient soil do not have much iodine, nor do meat or other products from animals fed on iodine-deficient plants. 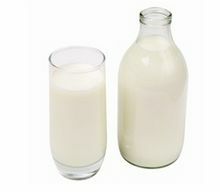 Because the breast concentrates iodine, milk and dairy products are usually a good source of iodine, but only if the cows get enough iodine. Although their native iodine content is low, iodine may be added as a result of iodine fortification of winter cattle fodder and/or iodine residues remaining in milk from disinfecting agents (iodophors) used in dairying. Remarkably, in countries without a regulation on iodized salt, adventitious iodine in milk is a major dietary source of iodine; e.g. in the UK and Norway. In many countries with iodized salt, milk and dairy products are particularly important iodine sources in children, including the U.S., Canada and Switzerland. Iodine exposure can come from many other sources. Drinking water drawn from certain aquifers or water disinfected with iodine can also be rich in iodine. Erythrosine is a red coloring agent high in iodine that is widely used in foods, cosmetics, and pharmaceuticals. Dietary supplements often contain iodine. Certain health foods, such as some types of kelp, contain large amounts of iodine. Other sources of iodine include water purification tablets, radiographic contrast media, medicines (e.g. a 200 mg tablet of amiodarone, an antiarrhythmic drug, contains 75 mg), and skin disinfectants (e.g. povidone-iodine contains 10 mg/mL). Iodate has been used as a bread stabilizer in commercial baking, although this practice is less common now. Many other environmental sources of iodine exist; most of them are unrecognized or unpublicized. Iodized salt is a special case. With only a few isolated exceptions, edible salt (sodium chloride) does not naturally contain iodine. Iodine is added deliberately as one of the most efficient ways of improving iodine nutrition. In countries in which salt is iodized, it is generally the major dietary contributor to iodine intakes, i.e. household salt or salt used in food production. WHO recommends levels of 20-40 mg iodine per kg salt. According to label declarations, commercially available iodized salt contains iodine in the range of 15-80 mg iodine per kg salt. Either potassium iodide or potassium iodate is used to fortify salt. The amount added varies widely in different regions. 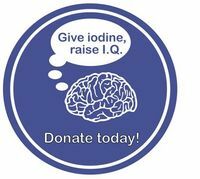 In Canada and the U.S., iodized salt contains 100 ppm (parts per million, same as 100 mcg/gram) as potassium iodide (equals 77 ppm as iodide), so 2 grams of salt contains approximately the daily recommended amount of 150 mcg iodine. In the U.S., you can buy salt that is either iodized or not iodized, and the price is the same; about 50% of all the salt sold in the U.S. is iodized. In Canada, all table salt is iodized. Most other countries add from 10 to 40 mcg iodine per gram of salt (10-40 ppm). Daily salt intake varies greatly in different parts of the world, ranging from two to five grams in many western countries to 20 grams in some others (10 g/day on average). In settings where foods are mainly home-prepared, household (table) salt is the major iodine source if it is iodized. By contrast, in industrialized countries, salt used in processed foods contributes approximately 60-80% of the total salt intake. The main salt sources from processed foods in typical Western diets are bread, dairy products and processed meat. The total amount of dietary iodine from salt in industrialized countries with iodized salt varies depending nature of the regulations on iodized salt, the acceptance in food manufacturing industries to use iodized salt, the type of industrial food products processed with iodized salt and the level of iodine defined in the standards. Boiling, baking, and canning of foods manufactured with iodized salt cause only small losses (10%) of iodine content. Dietary substances that interfere with thyroid metabolism can aggravate the effect of iodine deficiency, and they are termed goitrogens. Cruciferous vegetables, including cabbage, kale, caulifower, broccoli, turnips and rapeseed, contain glucosinolates; their metabolites compete with iodine for thyroidal uptake. Similarly, cassava, lima beans, linseed, sorghum and sweet potato contain cyanogenic glucosides; these may be metabolized to thiocyanates that also compete with iodine for thyroidal uptake. For example, linamarin is a thioglycoside found in cassava, a staple food in many developing counties. If cassava is not adequately soaked or cooked to remove the linamarin, it is hydrolysed in the gut to release cyanide, which is metabolized to thiocyanate. Improperly cooked cassava contains goitrogens that block the body from using iodine. Cigarette smoking is associated with higher serum levels of thiocyanate which may compete with iodine for uptake into both the thyroid and the secretory epithelium of the lactating breast; smoking during the period of breastfeeding is associated with reduced iodine levels in breast milk. Soy and millet contain flavonoids that may impair thyroid peroxidase activity. Use of soy-based formula without added iodine can produce goiter and hypothyroidism in infants, but in healthy adults, soy-based products appear to have negligible effects on thyroid function. Unclean drinking water may contain humic substances that block thyroidal iodination, and industrial pollutants, including resorcinol and phthalic acid may also be goitrogenic. Perchlorate is a competitive inhibitor of thyroidal iodine uptake, but 6-month exposure to perchlorate at doses up to 3 mg/d has no effect on thyroid iodide uptake or serum levels of thyroid hormones. Over 100 additional naturally occurring and synthetic substances have been reported to affect thyroid function or thyroid hormone metabolism, but most of these have not yet been well characterized in human studies. It appears most goitrogenic substances do not have a major clinical effect unless there is coexisting iodine deficiency.